scroll a page to any location using bookmarks/anchors. 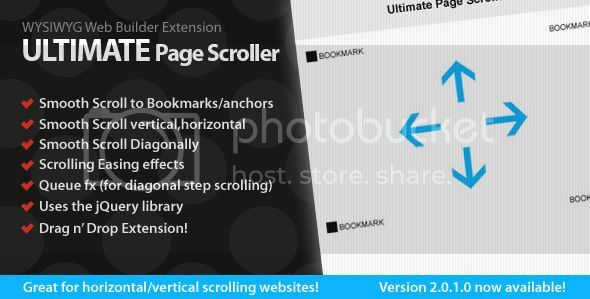 This extension will scroll to your bookmarks/anchors anywhere on your screen, vertically, horizontally and even diagonally! Create a page with height & width of 5000px and place bookmarks anywhere on the screen. Add some text and link to the bookmarks and watch it scroll to your destination. Drag and drop this extension. Add bookmarks to your page and link your text/images to that bookmark. Great for horizontal & vertical scrolling websites! Added: Easing effect to the page scroller. Fixed: Easier selection choice for directional controls. Fixed: Easier selection of Jquery usage. Fixed: Auto selection of Jquery usage. Fixed: Now works with WB version 9. Fixed: Now works with WB version 9 (bugs fixed). Credit goes to supersonictt for the 'queue fx' idea. UPDATE: I'm no longer supporting any of my old extensions as most of my extensions can now be produced within the software itself. If you continue to use, please note that they are no longer supported and no reply will be posted by the author. Last edited by madebyibloo on Thu Feb 16, 2017 12:19 am, edited 20 times in total. Thanks Joe, please re-download this extension as ive updated with jquery and added more features in the properties section. Looking forward to having a go with this one. nice new set of extensions . .
but in my other monitor 1280X1024 there is a big problem with it. Hi Joe, I noticed you are using other jquery in your code, have you tryed setting the 'jquery' to <!-- Do Not Use JQuery--> in the extension properties incase there is a conflict? lemme know how you get on. i done it. At preview there is all fine. I upload it and there is the same problem again. hmmmm, it has something to do with when the page first loads in your code, could you please send me your source file to: info [at] ibloo co uk ,and ill take a look for you and send you back. Add a Live Demo of the extension please. cdrums wrote: Hi, im having problems installing this extension, Is this extension compatible for all WYSIWYG versions? This extension is for WB7.